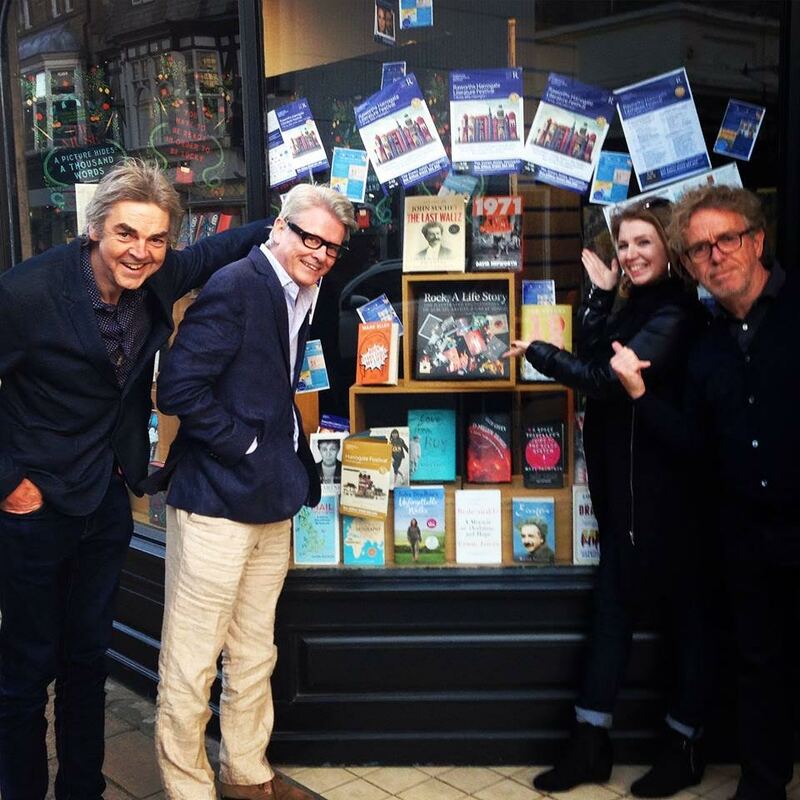 Mark Ellen, Paul Du Noyer, Zoe Howe and I were in Harrogate last week, plugging our books at the local literary festival (and, as you can see, admiring the display in the local Waterstone’s). Over dinner the evening before we debated that greatest of all rock & roll mysteries, greater even than the unanswered question of who wrote the Book Of Love; how come all the senior superstars of rock still have hair? There are exceptions. Pete Townshend. James Taylor. A few others. But they are exceptions. The Rolling Stones, McCartney, Roger Waters, Bruce Springsteen, Bob Dylan and Rod Stewart all appear to still have tons of the stuff and some of them won’t see seventy again. It only makes sense if you recognise the fact that hanging on to their hair is not a question of preference; it's a professional imperative. Mark remembered asking Rod Stewart how long he would keep on doing it and he said “as long as I have the barnet”. This wasn't just a flip comment. This was Rod speaking from the heart. You cannot sing “Maggie May” with a receding hairline. It simply can’t be done. The audience will take one look at you and know that both you and they are fooling themselves. We were thinking about our experience backstage at big shows, how every last detail of the performance is the responsibility of somebody, how it’s planned better than a military operation (whereas no battle plan survives first contact with the enemy, a rock show is a nightly battle where the outcome is guaranteed); is it possible, we thought, that there aren’t people back there whose job it is to make sure that the hair of the stars is not seen to its very best advantage, even if that means outright fakery? We decided that was unlikely, particularly since we’ve been watching the hairlines of the stars of the sixties and seventies recede, halt and then mysteriously advance again. And now that I’ve just read that Francois Hollande, the French President, put his ownhairdresser on staff, at a cost to the taxpayer of ten thousand Euros a month, I’m even more convinced that there has to be an entire army of colorists, camouflage experts, blow driers and titivators employed to keep us from seeing the uncovered domes of those we are pleased to call rock heroes. After all rock, like football management, is a business that’s about one thing above all. Hair. Wayne Rooney never seemed to mind going a tad thin on top. Or am I thinking of somebody else? Re The Stones. Keith's hair is receding and he doesn't dye it any more. Can I be the first to note the wisdom in the old saying "hair today, gone tomorrow "? "Can I be the first to note the wisdom in the old saying "hair today, gone tomorrow "? Or as Popeye had it, "Hair today goon tomorrow". Does Phil Collins qualify in any of the "Rock" departments? I think McCartney's remnants are very carefully coiffured. These guys should an Ian Anderson, and embrace the loss. Has there ever been a photograph of David Bowie taken without him having an immaculate barnet? yet further proof of rock god status!